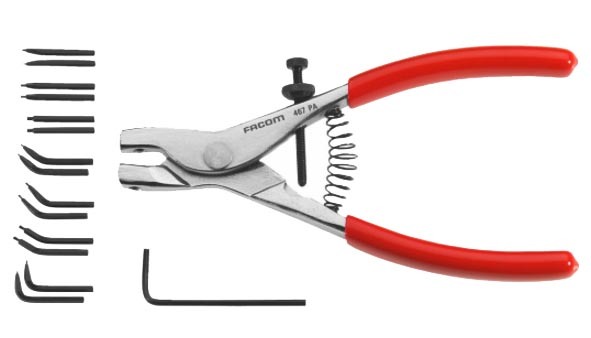 Facom Outside Circlip Pliers (467) - Interchangeable tips with a range of 3-63mm. Finish: chrome finish, red PVC grips. Supplied with hex key and sets of tips E1 - E2 - E3 - E5 - E6 - E8 - E9. Also available in a set (Facom # 470) with both inside and outside pliers and ALL tips. I keep all replacement tips in stock.